Everything is being modernized, so why don’t you have your restaurant or diner a modernized outlook using the fashionable chef logo. With these elegant logos, instantly grab the attention of the food lovers and tempt them to visit your restaurant to taste delicious food. We gathered the best logo designs to give you and your restaurant an effective recognizing symbol that will definitely amaze your competitors! Here’s an assortment of chef logos that display different scene of restaurants such as chef carrying food, chef serving food, chef appreciating taste of food and many more. With these logos as your symbol, you will not require words to convey your message and details related your food services. 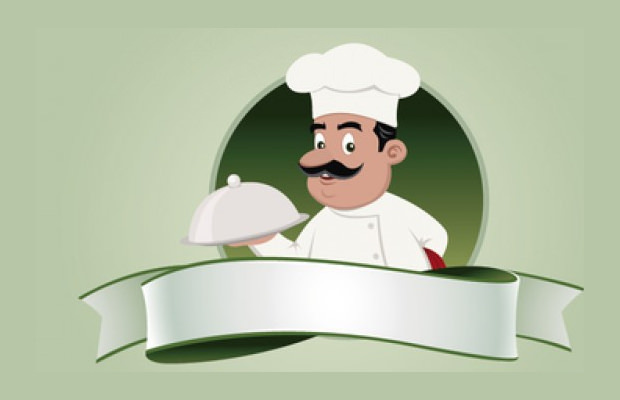 There are chef hat logos available consists of size, height, and shape of the hat, you download one as per your desire. The chef’s hats are accessible in its standard white shade as well as in other colors like gray, red, etc. For an eating-place serving vegetarian foods, the logo with broccoli signifying green hat can be an ideal selection, after all, it blends with the idea perfectly. Even for fast food services, there’s chef logo including bicycle structure to portray the quick take away services the place offers. Rather than using these creative logo designs only on the outlet of your restaurant, you can add them up on food boxes, menu cards, flyers, and websites to denote that it all belongs to a particular chef. Download your set of inspirational chef logo quickly and convince every visitor to taste your talent in food!